If 4 rotations are specified, they will be used at random on generation, so approx 25% facing any direction, and it will rotate properly. If 1 rotation is used, they will all point the same way, but when you rotate, the rest of the map buildings rotate but the church wouldn't. Hope that makes more sense. Most churches do point East, but enough don't for me not to worry about it. Examples I can think of are Liverpool Cathedral and All Souls London, both of which point more or less north. thanks for explaining the random rotations. in that case it's impossible to align the churches properly anyway. do you think this is worth an extension request for standard? i was missing an indicator pointing north for quite a while, geting confused when turning the map. churches could do that job in a very natural way. Jury decides executioner gets to work. Stone shops and houses ready. 4 more buildings to go. I am not getting impatient. Just starting to have fun. Should I update my zip now or after they are all done? If someone finds this useful, feel free to use it. Just update once they are all done. I'll include them all in the next release of pak128.Britain, which will be pretty soon after you finish them! If the church was built first, or at the same time as the surrounding estate, or in its own enclosure (large churchyard), one of which is normally the case, then it will almost always face east-west. 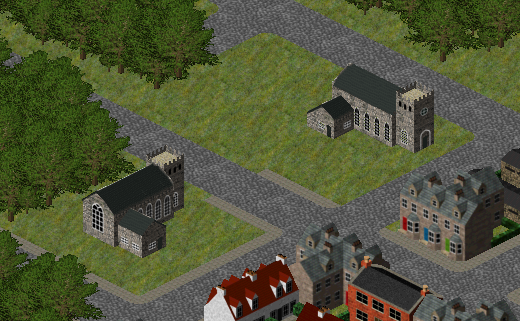 If the church is built later than the surrounding buildings, say on a constrained urban site, it will fairly often be oriented to best fit in with surrounding buildings or features (eg align with roads etc). If the church is pre-Georgian, it's a fairly safe bet it faces east-west. I carry a lensatic compass in my bag at all times (both for work and for hiking), it's very handy to avoid getting lost in places like London! more on the building, (better roof texture and windows)... no progress on the surroundings yet. All buildings ready. Remembered special colors while writing this message and removed those. Also made non-corner version of tenement and stone cottage. haven't tested these much yet but should be ok. This is preview of my new school/prison. it still needs lot of work. Very much like! But "school/prison" - what are you saying about education? Very nice. I was wondering why it had gone quiet on here. I think we'll go with school rather than prison. well it is supposed to be school but it looks more like prison to me. And there are gates so kids have no way to escape. But the roof looks a little bit too continuous. There should be some more contrast around the roof ridges. It looks maybe little more like school now but yard needs some details. What do you think about those roof windows? Second picture is first from that angle so there is still more work needed for it. Yard details could include some things like hopscotch squares or a football goal or similar marked on the floor/wall. Roof light is a good idea, but maybe better smaller. Don't forget a sign out the front (the sort that would say "Anytown Grammar School" on it). That'll help too. That looks beautiful - although I'd think that the graveyard would need more graves, and possibly iron railings around it, too...? Could you post the tilecutter.log file? Most likely reason for it exiting so quickly is not having wxPython installed. Wow, just wow I think it l looks perfect - though obviously ingame screenshot would be nice to check consistency but looks good to me! Some progress still little things that need work. I can almost smell the chalk and the floor-wax. Regarding the latest renders - you seem to have shadows enabled in some form. While it's a nice effect rest of renders don't have it (and it doesn't work well with the simutrans engine which is why I didn't have them to begin with). Haven't done much work on it for awhile, but for the record here's the Stone Church files (source and pak). Mostly needs ground removed (except in graveyard, where the grass is always greener) and correct fences added. Little bug fix for previously released buildings. I have downloaded it - the revised version can be found in my Pak128.Britain-Ex Github repository. re-uploaded stone church file to correct server this time (oops).